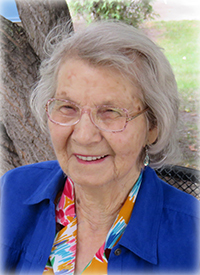 Polly Bobocel (nee Oneschuk) born in Shepenage, Alberta on November 1, 1924, passed away peacefully in St. Albert, Alberta on February 5, 2019 at the age of 94 years. Widowed at 36, much of Polly’s life was focused on single-handedly raising her seven daughters, and on operating a small farm near Vilna, Alberta. Her faith gave her strength. After the last daughter left home, she sold the farm in 1994, moved into the village and turned her energy to helping nurture her numerous grandchildren, while working part-time as a cook in the hospital kitchen. Polly was a tireless and cheerful worker; she loved playing bingo and gardening in her spare time, and she was remarkably lucky at the first and very skilled at the second. Her prowess in the kitchen was amazing, and her pastry was legendary. Only modesty prevented her from entering contests. In fact, her daughters still cherish many of her recipes, including her top secret, flaky pie crust. In her final years Polly’s most joyful moments were when a new great-grandchild was plopped onto her lap. To her delight that event occurred 11 times! Those left to cherish many fond memories include her children, Margaret (Ernie), Shirley, Dianne (Bill), Marcella (Desmond), Linda, Irene (John) & Ramona (Colin); her 11 grandchildren, Lisa, Amanda, Christopher, Kyle, Jessica, Clare, Will, Emma, Kelly, Megan & Nate; 11 great-grandchildren, Mikayla, Bailey, Tristen, Caiden, Ava, Nicholas, Alexander, Thomas, Orla, Ronan & Lumen; Polly’s sisters, Anne & Rita; numerous nieces & nephews. Polly was predeceased by her husband, Roman (Nov 12, 1919 – Oct 25, 1961). A funeral service will be held on Monday, February 11 at 10:30 a.m. at Grace Gardens Funeral Chapel, St. Paul, Alberta. Reverend Father Benny Ambrosie will be officiating, with interment in St. Paraskevia Ukrainian Orthodox Cemetery, Downing, Alberta. If desired, donations may be made to Stollery Children’s Hospital Foundation or St. Paraskevia Ukrainian Orthodox Church, Downing, c/o 5626 – 51 Street, St. Paul, AB T0A 3A1. To send condolences online, please visit www.gracegardensfuneralchapel.com. The family would like to thank the staff at The Citadel Care Centre in St. Albert for their help, their kindness and their support in caring for Polly during her final years. Polly will live on in the memories and actions of the family that she loved and devoted herself to. We will be forever guided by her words, her gracious deeds and her quiet determination. Auntie Polly will be forever loved and remembered by our family! She was always so kind, generous and good to all of us! As little as she was, she was so strong and so full of goodness! and she raised such a wonderful family of girls! We have such great memories of your Mom! You are all in our hearts and our prayers. Thinking of all of you with the passing of Auntie Polly. She was an amazing woman that raised amazing women. She lived a long life. When we were children and you were living on the farm, I remember the great lunches she always provided when we would visit. May the thoughts, prayers and presence of family and friends bring you comfort. Ramona My heart goes out to you and your sisters in your time of sorrow. I have such fond memories of your Mother. My thoughts and prayers are with you all. So sorry to hear of your loss although I never spent much time with Polly truly enjoyed her company and yes she was a good cook. You all take care. We got to know Polly through church in Fort Saskatchewan. I thought she was the most amazing and strong woman. I grew to love her very much and I know she will be greatly missed. Memory Eternal! 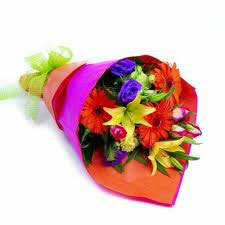 To Irene & family, our condolences for the loss of your mother. Take care. Please accept our condolences on behalf of Doris Harasem, Jim and Terrie Stefaniuk. Polly was a dear friend to my mother. Her kind and generous spirit will be a constant reminder of the many good years these two wonderful women shared. Unfortunately we are out of the country and unable to attend your moms service. To Polly’s girls and their families – our heart felt thoughts and prayers are with you today. Your mom was a special lady and a very good friend to ours. Many memories and good thoughts go your way. Extended love from the Strayski family – Irene,Orest,Ron, and Terry and families.